Total Antioxidant Capacity Assay Kit ab65329 can measure either the combination of both small molecule antioxidants and proteins, or small molecules alone in the presence of our proprietary Protein Mask. In the total antioxidant capacity assay protocol, the Cu2+ ion is converted to Cu+ by both small molecule and protein antioxidants. The Protein Mask prevents Cu2+ reduction by proteins, enabling the analysis of only the small molecule antioxidants. The reduced Cu+ ion is chelated with a colorimetric probe giving a broad absorbance peak around 570 nm, proportional to the total antioxidant capacity. Antioxidants play an important role in preventing the formation of, and scavenging of, free radicals and other oxidizing species. There are three categories of antioxidant species: enzyme systems (GSH reductase, catalase, peroxidase, etc. ), small molecules (ascorbate, uric acid, GSH, vitamin E, etc.) and proteins (albumin, transferrin, etc.). 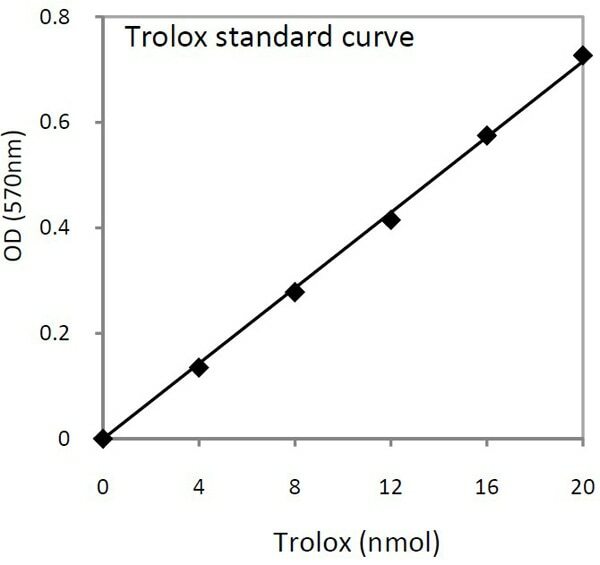 Trolox is used to standardize antioxidants, with all other antioxidants being measured in Trolox equivalents. Measurement of the combined non-enzymatic antioxidant capacity of biological fluids and other samples provides an indication of the overall capability to counteract reactive oxygen species (ROS), resist oxidative damage and combat oxidative stress-related diseases. Antioxidants play an important role in preventing the formation of and scavenging of free radicals and other potentially toxic oxidizing species. There are three categories of antioxidant species: enzyme systems (GSH reductase, catalase, peroxidase, etc. ), small molecules (ascorbate, uric acid, GSH, vitamin E, etc.) and proteins (albumin, transferrin, etc.). Different antioxidants vary in their reducing power, and cooperation of all different antioxidants provides greater protection against reactive oxigen or nitrogen radicals than any single compound alone. Therefore, the overall total antioxidant capacity may give more relevant biological information compared to that obtained by the measurement of individual components, as it considers the cumulative effect of all antioxidants present. Total antioxidant capacity was determined in mouse cardiac homogenates using Total antioxidant capacity assay kit (ab65329). 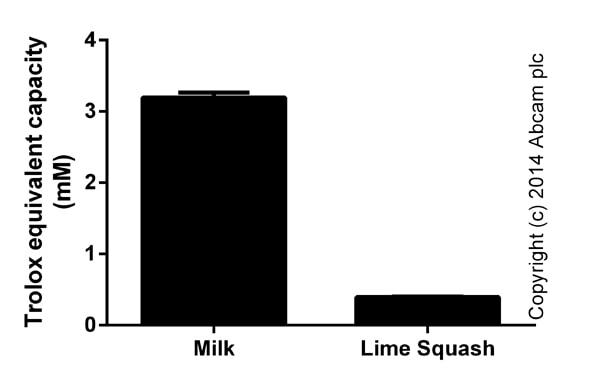 Trolox equivalent capacity measured in mouse tissue lysates, showing quantity (nmol) per mg of extracted protein. Results following blocking of protein activity is shown (Mask). (Duplicates; +/- SD). Trolox equivalent capacity measured in biological fluids. Results following blocking of protein activity is shown (Mask). Background signal subtracted, duplicates; +/- SD. Publishing research using ab65329? Please let us know so that we can cite the reference in this datasheet. Rice plants from control and Fe stress (300 ppm Fe2+ for 3 weeks) treatments were harvested with liquid nitrogen and stored in -80 °C freezer. 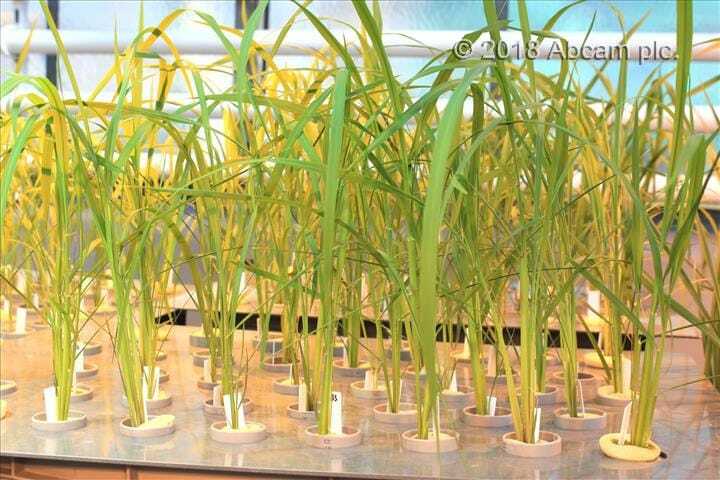 Rice shoot tissues were applied in the test. Grind the rice shoot tissues to fine powder with pre-chilled pestle and mortar in liquid N. Around 50 mg of samples were weighted in 2 ml micro-centrifuge tubes and 1 ml of PBS were added to extract the total antioxidants. After 2 mins of vigorously vortex, the mixtures were placed on ice for 10 mins. Subsequently, the tubes were centrifuged at 14,000 g for 5 mins at 4 °C followed by collecting the supernatants into fresh 1.5 ml micro-centrifuge tubes. To remove the small debris, the tubes were centrifuged again at the same speed for 2 mins. Load the trolox standards and samples to the micro-plate according to the protocol. Both standards and samples were measured with two replicates. After adding the Cu2+ reagents, the micro-plate was incubated at room temperature in dark for 90 mins. Measure the absorbance of different wells at the wavelength of 570 nm. The total antioxidant capacity (trolox equivalent) was significantly induced by the excess Fe treatment in rice shoot tissue. 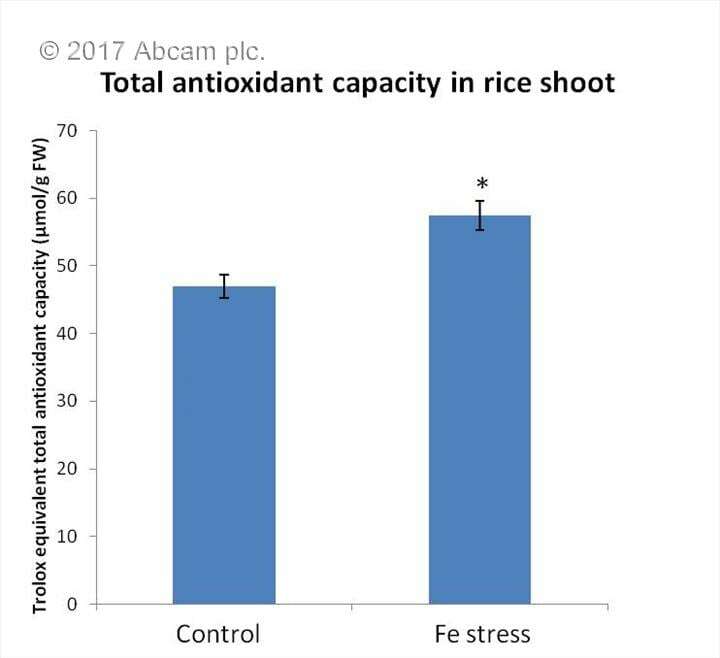 The total antioxidant capacity (trolox equivalent) was significantly induced by the excess Fe treatment in rice shoot tissue (see attached image).